Meet Lauren who signed up for Online Dating BootCamp with Cyber-Dating Expert Julie Spira. In a video series on YourTango, we’ll follow her progress while she looks for love online. Lauren has a new profile on Match and has high hopes that she’ll find someone to marry. 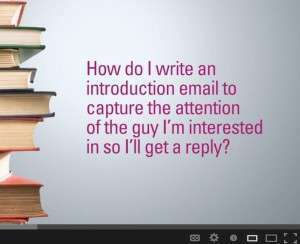 In this video, you’ll find out how to create a catchy screen name, learn the best number of photos to include in an Internet dating profile, and how to describe exactly what you’re looking for. It’s with great enthusiasm to announce that Online Dating BootCamp will go on the road to Las Vegas in January of 2012. Online Dating BootCamp matches four single daters with up to eight online dating and mobile dating apps. Online Dating Expert Julie Spira will coach each single dater, helping them to create an irresistible online dating profile. The singles will be hosted by the Internet Dating Conference, where they will be participating in a mobile dating focus group at Harrah’s Hotel on the Las Vegas strip. To apply to be a contestant, visit CyberDatingExpert.com/contact and let us know why you’d like to find love online. To register for the iDate Dating Industry Super Conference on January 16-19, 2013, click here for $50 off. As April is winding down, there’s no shortage of Spring Fever in the air. My inbox is filled with emails from happy online daters, so without further digital adieu, here are some of our favorite articles from the web and on Twitter this week. First up, our moment of gratitude.? Thank our pal Sofi at Yahoo! Shine who included us in her article, Controversial Miss Travel dating site proves there’s no such thing as a free trip. Thank you as well to FOX News in Charlotte for the wonderful interview on online dating safety. We’ll post a link next week. Over at CNN, Brenna Ehrlich and Andrea Bartz shared some of their favorite online dating sites in Three Niche Dating Sites for Targeted Romance. Their list included SingleFitPeople.com, TasteBuds.com for music enthusiasts and Tawkify, based on Klout scores for social media powerhouses, which we featured last week. On Huffington Post, I featured a story called, Puppy Love: New Online Dating Sites for Dogs. Shouldn’t your puppy find love on the Internet? One out of ten pets do have a Facebook profile. Are you in that percentage? On Singles Warehouse, our friend Laurel House (@QuickieChick) gave her opinion on who should pay for a first date. Laurel believes in chivalry with the gentleman picking up the tab. What do you think? At Tecca, they posted Geeky Tales: 10? techie marriage proposals that worked. Our favorite pick was Digg employee Matt Van Horn’s “Proposal 2.0 Marry Me Leslie.” Of course, she said yes! Our friends at YourTango are in the middle of their Online Dating Bootcamp. Our three best online dating tips are scheduled to post on April 29th. Our favorite tip this week was from Janet Ong, 10 Dos and Dont’s Before Meeting Mr. Online In Person.